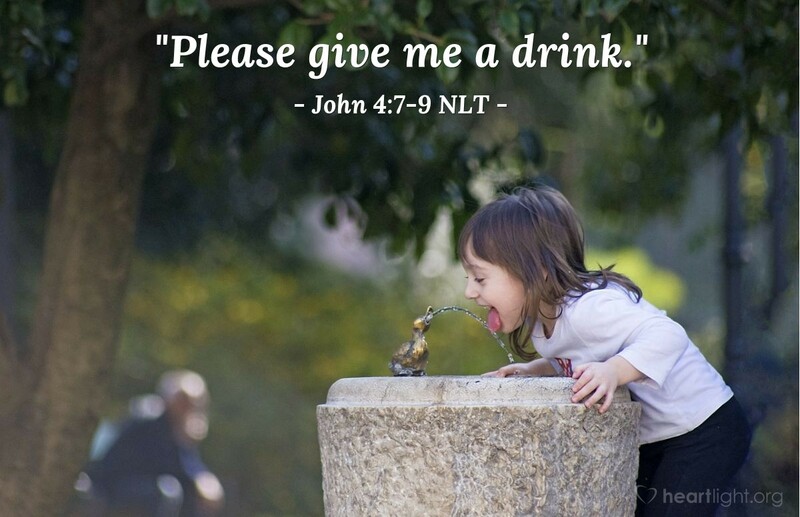 Soon a Samaritan woman came to draw water, and Jesus said to her, "Please give me a drink." He was alone at the time because his disciples had gone into the village to buy some food. The woman was surprised, for Jews refuse to have anything to do with Samaritans. Asking for a drink doesn't seem like a big deal. In this case, however, it is a huge deal! Jesus is a Jew. Jews considered Samaritans unworthy and unclean cousins. Jews felt that even simple interactions with a Samaritan would defile them. Jesus is a Rabbi, a male teacher of Israel. A "real" Rabbi didn't talk publicly with any women in Jesus' day. But this woman was seeking. This woman was alone. This woman was thirsty for living water. This woman needed Jesus. Jesus let nothing stand in his way of reaching her. Jesus is always a barrier breaker. Are we? O Father, give me a heart to treat people as Jesus did. Fill me with your Spirit. Open my heart to your concern. Use me to break through barriers and establish connections so that others can come to know Jesus, find his living water, and share that gift with others. I ask this in the name of Jesus. Amen.